My brother had a pulmonary embolism last week. 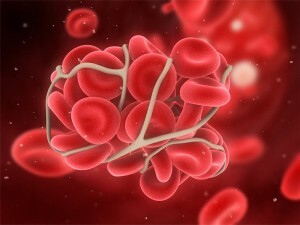 It’s a blood clot in the lung that can cause sudden death. I’d be so sad if something were to happen to him that I don’t even want to think about that. Apparently, he had chest pain and shortness of breath. He wasn’t even going to the go to the doctor, just went to bed to lie down, but thank goodness for his wife who insisted that he go to the hospital immediately. He’s fine now, but he’ll be on medication for life and he has to have his blood levels checked regularly. So, he calls me to tell me about all of this after he’s been in the hospital. I panicked by his call ‘cause he never calls, thinking that a call from him meant something horrific had happened to someone in our family. I wasn’t too far off base. Anyway. He tells me that he has a Factor II mutation in his blood. It’s what our father had, too. Before they discovered this, however, he’d been discussing his family history with the specialist, and one of the questions the specialist asked him is whether there’s any history of miscarriage in our immediate family. Of course. There’s me. The specialist tells my brother that a hereditary Factor II Mutation could be the cause of my previous miscarriages and I must get it checked out with a specialist so that something can be done to protect my current pregnancy and my life after the baby is born.